So, let’s make a radio show we said. And make a radio show we’re doing. And it’s a blast. And, dare I say it, it’s good. Sustainable Lens: Resilience on Radio has now had five shows (podcasts from sustainablelens.org). 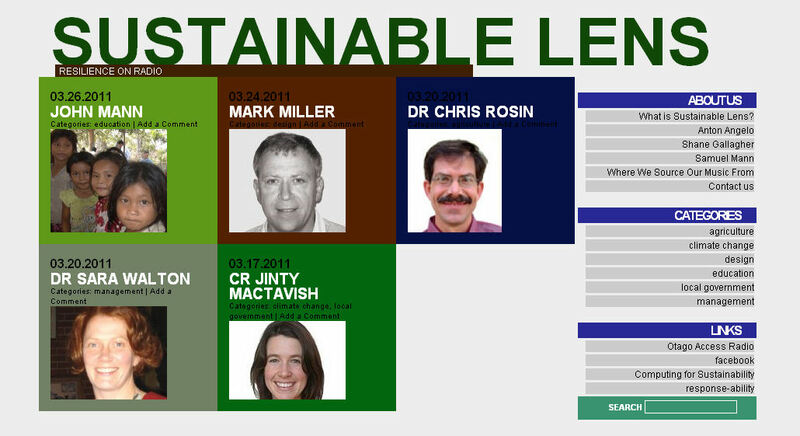 Each week Anton Angelo, Shane Gallagher and me talk with an invited guest, all through the lens of sustainability. Jinty MacTavish: Dunedin City Councillor in a wide ranging discussion. Dr Sarah Walton: Otago University Management Department talks ecopreneurs. Dr Chris Rosin: Otago University Centre for the Study of Agriculture, Food and Environment talks agriculture. John Mann: Educating Cambodia (yes, Dad). Listen in – what do you think? We’re on Otago Access Radio (Thursday NZ 7-8pm 105.4FM/1575AM in Dunedin) or Podcast. We’ve got lots of guests lined up but ideas for more always appreciated.